Introducing the all new Bear Hybrid. This is Bears 2nd model and they broke into the hybrid market. At 14.5″ thick this mattress packs a lot of features. The hybrid is more substantial than their foam mattress but uses some of the same great cooling and recover components. Interested in cooling and recovery? Check out the Bear for which utilizes graphite infused memory foam for cooling and recovery. The Bear Hybrid hits the market hot on the heels of its amazingly popular predecessor, but now comes in hybrid form, with an added 2.5-inch coil support layer. Bear are a well known name in the bedding game, with a huge online presence and a hoard of glowing reviews under their belt. Using their patented Celliant technology, the Bear Hybrid offers an elegant solution to muscle recovery by using heat-reactive fibres which promote blood circulation. This makes the Bear Hybrid great for those who are active, and the mattress is marketed as such. However that doesn’t mean it shirks on comfort, and you’ll see in our ‘materials’ section that the mattress also offers plenty of luxury. Bear’s use of a gel-infused cooling foam layer, coupled with their breathable performance foam, also makes this an interesting prospect for cool-sleeping. This mattress was made as the result of extensive testing by a team of athletes, in an effort to maximise recovery times. With this kind of scientific focus, Bear are laying down a gauntlet in the world of premium, luxury bedding. Bear also donates a percentage of every sale to Good Sports – a charity that works to promote sport and healthy activities for kids. Buying a luxury mattress requires solid research, and a competent knowledge of materials, styles, builds etc. 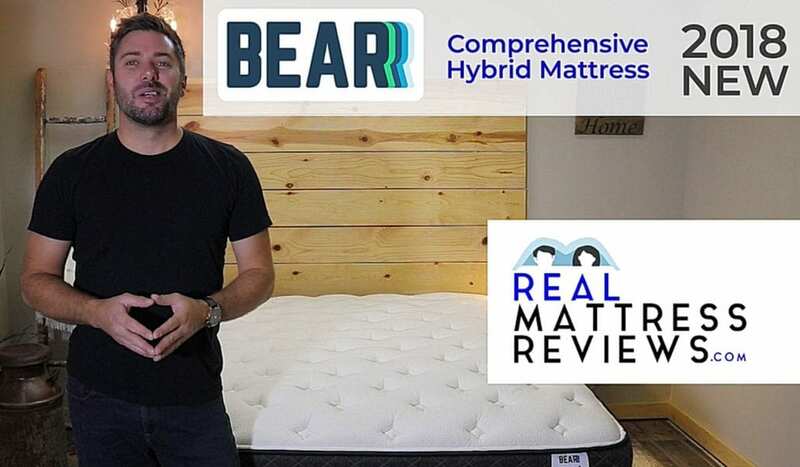 This review will break down everything you need to know about the Bear Hybrid mattress, to save you the time. So, read on, and find out if this is the mattress for you. Bear Mattress has been around a couple years now. They’re 2nd mattress model was just released. This is the all new Bear Hybrid. All orders of Bear products are processed and sent to the production team within twenty-four hours. Delivery is FREE and the mattresses ship from factories in California, Wisconsin and Georgia. Depending upon you location your bed should arrive in 4-7 days. If you order peripheral items from Bear – pillows, sheets etc, be aware that these may arrive at different times as they are produced in separate factories in New Jersey and North Carolina. Note: The Bear Hybrid takes longer to ship due to its weight. Expect the Hybrid mattress within 7-10 days. Nobody needs to be home to sign for the boxed bed, so you can specify delivery options when placing your order. As always, move the box into your chosen room before opening. The mattress will expand quickly and may become harder to move. Use scissors to cut the mattress from its wrappings, being careful not to damage it as you do so. Additionally, Bear are currently partnered with removal company, 1-800 Got Junk, and offer discounted rates for removing your old mattress. You can specify your options during checkout. Bear recommend that you don’t leave your mattress boxed for any longer than 90 days. Opening your mattress sooner will also result in less off-gassing when you unwrap it. To avoid off-gassing be sure to open and unwrap the mattress sooner rather than later. Off-gassing occurs purely due to the wrapped, boxed packaging of the mattress, and isn’t likely to be a long term problem. For the best results, allow the mattress to air out for 24-36 hours after opening. This will match up with the time it takes for the mattress to fully expand, so isn’t too inconvenient. If you are particularly sensitive to smell, stand the mattress up on its end when it’s fully expanded, and allow it to air out in a well ventilated room. By the time you apply a mattress protector and sheets, any smell should be long gone. 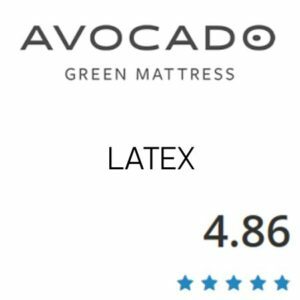 Off-gassing is generally more of a problem for mattresses using natural or organic materials. This does not apply to the Bear Hybrid, although it does use water-based adhesives rather than chemical. This bed is manufactured and produced on-site in the U.S, so the risk of substantial off-gassing is reduced further. A ‘new mattress smell’ is common and not to be worried about. The Bear Hybrid doesn’t emit any smells after the airing out period, and presents no off-gassing issues. The Bear Hybrid allows you to sink into its top layers, before you feel the quiet support of the high performance foam and pocketed springs. 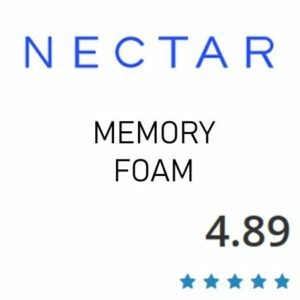 Officially rated as a medium-firm mattress, it still offers luxurious comfort along with its firm support. This makes the Bear Hybrid suitable for those who want that luxury, soft feel without sinking all the way into the bed. The top layer itself is 2-inches of quilted foam, encased in a Celliant cover which reacts to your body’s heat. This patented technology from Bear recycles your heat into infrared energy, which boosts blood circulation in your body. This gives the bed its healing effects while providing a lush, tufted surface. Mattress protectors and sheets may alter the softness of the quilted top cover, but only if they are overly thick. However Bear also sell mattress protectors made from the same material as the bed cover, so that’s a big plus. The comfort that won the original Bear mattress all of its praise is still very much in effect here. 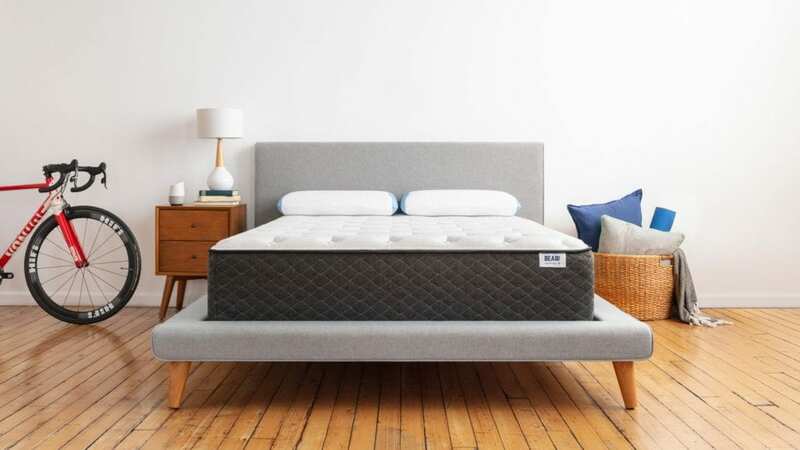 Hybrid mattresses often lack the luxuriousness of all-foam mattresses, but the Bear Hybrid is equipped with enough quilting and padding up top to give you the best of both worlds. 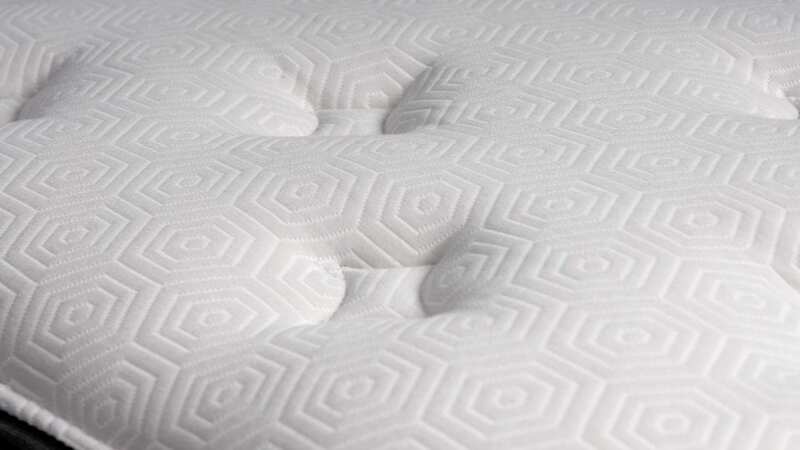 The unique use of the foam base allows the coils to rest on a responsive surface, allowing for more body-contouring than normal spring-mattresses. 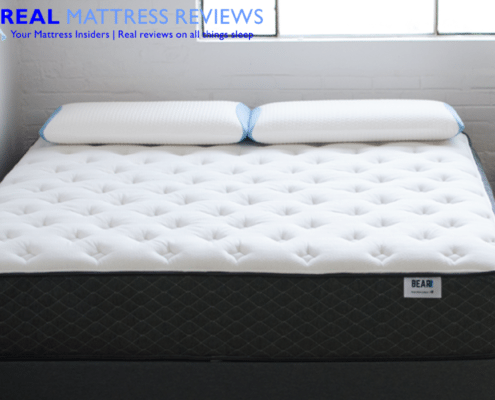 The mattress is soft and firm where it needs to be, and truly delivers on offering a lavish but supported sleep. Want a super soft mattress – Bear is a medium-Medium Firm feel. If you prefer an extra soft mattress you will want to look elsewhere. Or extra firm. Are a heavier sleeper – I usually recommend mattresses more than 10″ thick if you are over 280lbs. 1st layer – 2″ of quilting foam quilted into the cover. This foam provides a soft pillowy feel on top and a more substantial feel than a thin zip on cover. 2nd – 2″ of Bear Performance foam – this layer provides additional comfort and pressure relief but with a good amount of bounce. 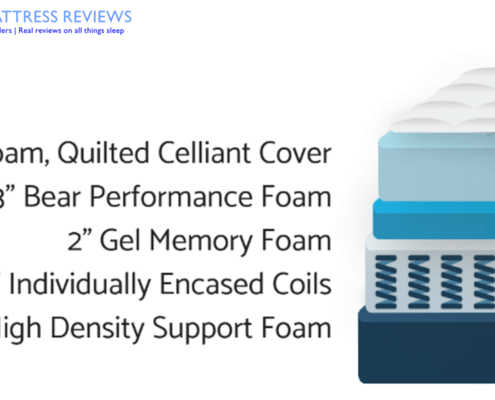 3rd layer – 2″ Gel Memory foam – this layer adds deep support and pressure relief. 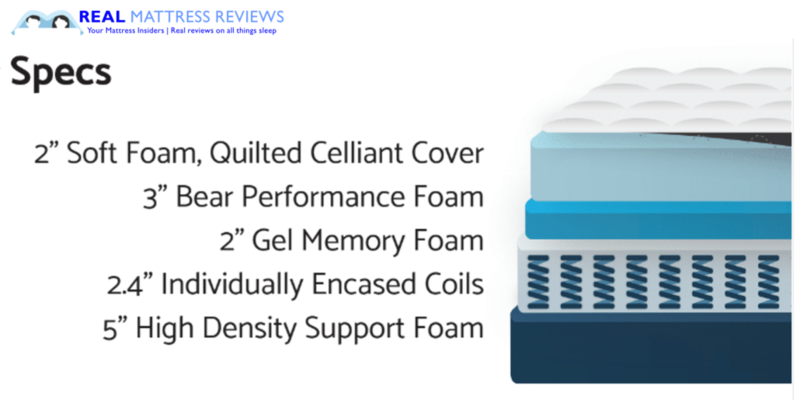 2.4″ Pocked Coils – the coil layer will help the mattress have a bit more bounce than a foam core and allows for great airflow. 5″ Foam core – This foam core will add additional deep support and foundational support for the mattress. The Bear Hybrid uses a combination of materials and technologies to deliver a unique bedding experience. The mattress uses a mix of eco-friendly, breathable, patented technologies, arranged in a specific manner for maximum effect. The next layer is 3-inches of Bear’s performance memory foam which acts as the primary comfort layer after the generously quilted cover. This has latex-like properties, and provides some bounce along with its comfort. The cooling layer is also designed to contour to your body shape, relieving pressure and keeping you cool at the same time. These 2-inches of gel-infused foam draw heat from the top without holding onto it. It does two jobs at once and does them well. The primary support layer is the system of 2.5-inch pocketed coils which are individually wrapped to allow for individual movement. This allows for solid support, and a responsiveness which isn’t achieved by traditional spring mattresses. Finally, the base of the mattress is 5-inches of high-density polyfoam which provides a solid but reactive foundation to the bed. This gives the coils a cushioning of foam on both sides, and reduces their noisiness while increasing their flexibility. The Bear Hybrid utilizes premium materials in a unique way, and gets the most out of its hybrid design. Its use of water-based adhesives helps get the most out of the materials without clogging them with chemicals. Bear will work great on any solid surface. The floor, platform slats, boxspring/foundation and they now offer an adjustable base as well. We had a good experience on the Bear Mattress. I am generally one who prefers thicker mattresses but Bear didn’t bottom out easily and had a good overall feel. I always use a mattress protector so some of the benefits of the cover may not have been noticed for me. The nice thing is now they offer a mattress protector that uses the same fabric as the mattress! The Bear Mattress impressed me for the following reasons. A.) To me the overall build and quality was above average. The benefits of the fabric and the graphite are special to the Bear. B.) The top comfort layer really didn’t get hot (it was my 1st time on graphite gel memory foam). For me the Bear Mattress had a good medium feel. It conformed well even though I am light but still had good support for Ross who is heavier. Bear slept cool (although i’m always cold) Ross will comment all the time if a mattress sleeps hot. That was not happening on the Bear. I tend to like a soft mattress so I sink in a bit more but it felt nice even though its not uber soft. The top layer gives in and conforms very well for any weight. The Bear Hybrid uses several technologies to promote air-circulation and regulate temperature. Breathable performance foam works to comfort and cool, while the quilted cover is able to transfer heat without trapping it. The layer of gel-infusion technology beneath the comfort layer absorbs and dissipates heat. Bear promote this as being seven times more efficient at cooling than traditional memory foams. The coil layer of hybrid mattresses is a major boost for regulating temperature, as its open, aerated nature allows heat to flow naturally through the bed. Traditional memory foam mattresses suffer in comparison due to the compacted structure of the foam layers. The Bear Hybrid also uses water-based bonding solutions, which don’t clog up the materials like conventional chemical adhesives. Bear market this particular mattress as being a cool sleeper, and they’ve backed that up with their use of cooling technologies. Ultimately, it provides enough breathability and air-flow to avoid the trapping of heat during long periods of sleep. An important factor in choosing a bed, a good edge support rating tells you how much of your bed you’re really getting. You expect to the full bed, and not just the middle. 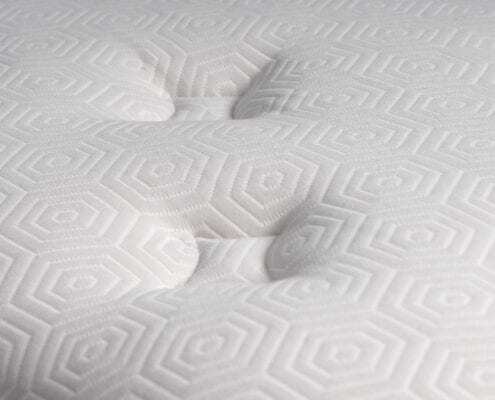 Hybrid mattresses have a leg-up in this department, as the pocketed coil layer provides sturdiness around the edges not usually achieved by all-foam models. Likewise, the base foam layer provides even more foundational support, while also allowing for flexibility. The Bear Hybrid feels consistent at the edges, and they don’t sink down when you lay near them. Meanwhile, sitting directly on the edge of the bed will show some compression, but that’s to be expected. 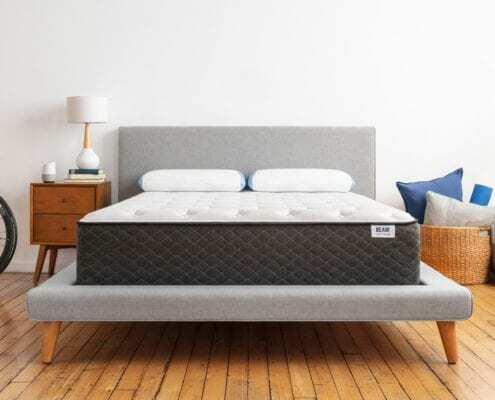 The combination of foams and coils provide the kind of edge support expected of a hybrid mattress, and the Bear Hybrid outperforms the average memory foam mattress in this regard. Let’s face it, when you decide to splash out on a top-end mattress, you want to know what you’re getting before parting with your hard-earned cash. Luckily, the Bear Hybrid comes with a free 100-night trial period. The manufacturers recommend you sleep on the bed for at least 30-nights before making your decision. 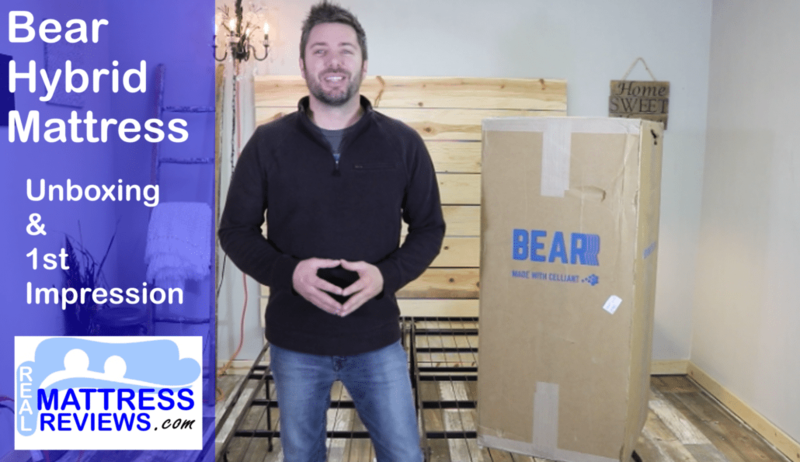 If at any point between days 30-100 you decide this isn’t the right mattress for you, Bear will arrange pick-up of the mattress and reimburse your purchase with a full refund. Extras like pillows and sheets come with a 30-day refund period due to their lack of re-use potential. The warranty for the Bear Hybrid lasts 20-years. 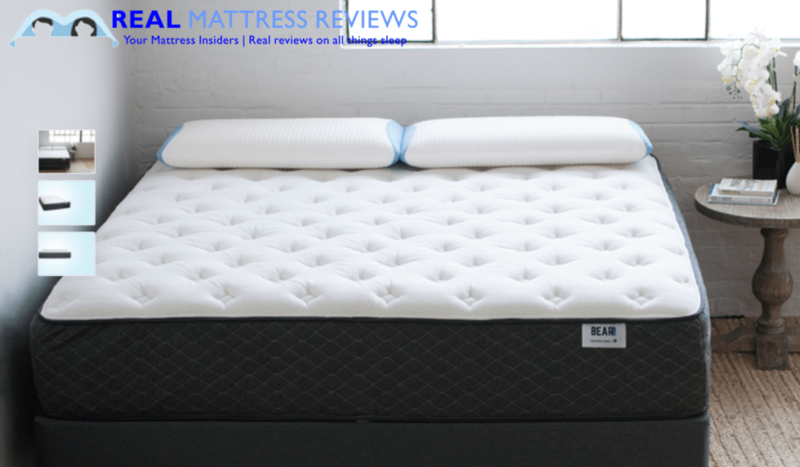 During that time, if a defect arises that can be shown to be the fault of the manufacturer, then Bear will either repair or replace your mattress free of charge. While other companies offer longer trial periods, the 100-days offered by Bear is ample time to get to know your mattress. The 20-year warranty is a sign of confidence in the product. Bear Mattress is a great medium option for those of you who sleep in multiple positions. 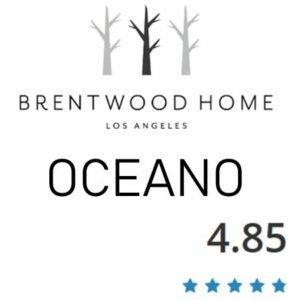 The mattress slept cool and with the direct to consumer pricing they also are a good value. The health benefits of the cover may also be something you want to consider. They really like to market to athletes and people who need to re-charge.